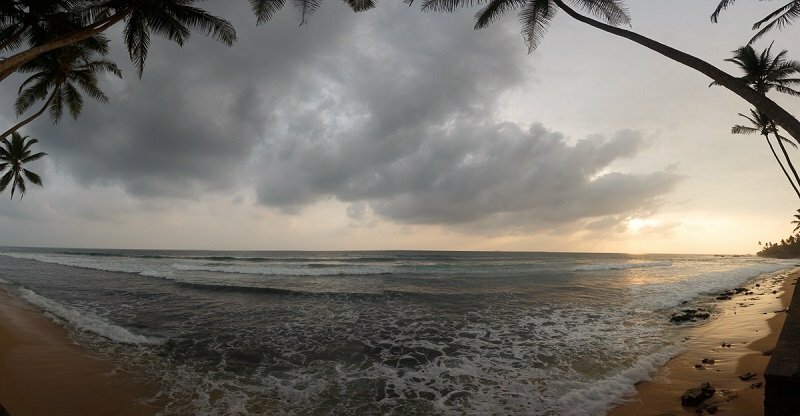 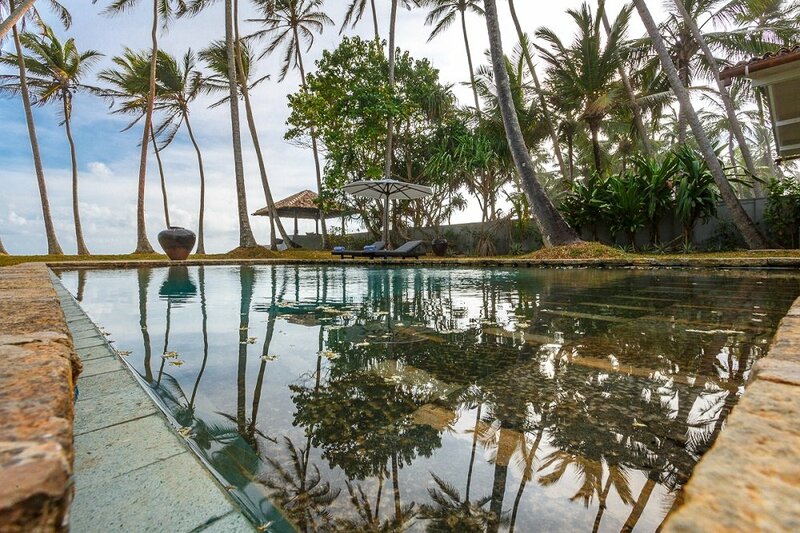 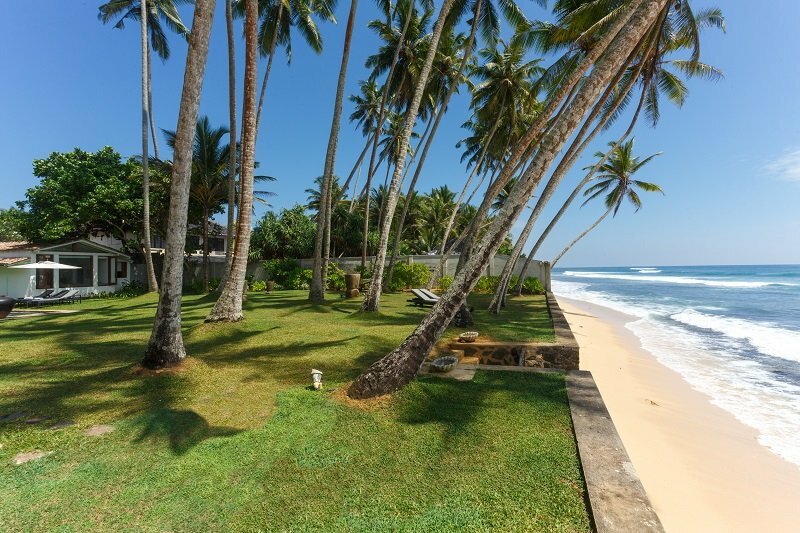 A Lovely fully staffed Beach Villa with a pool in Talpe, Galle. 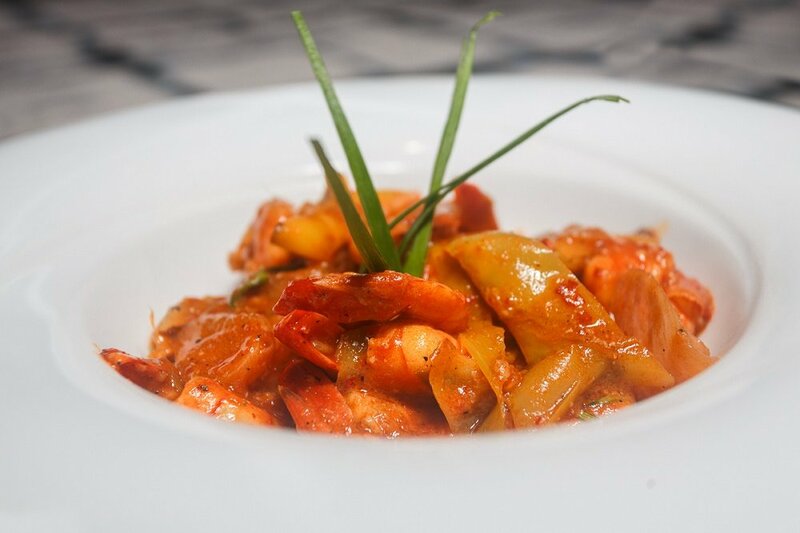 With an excellent chef and service. 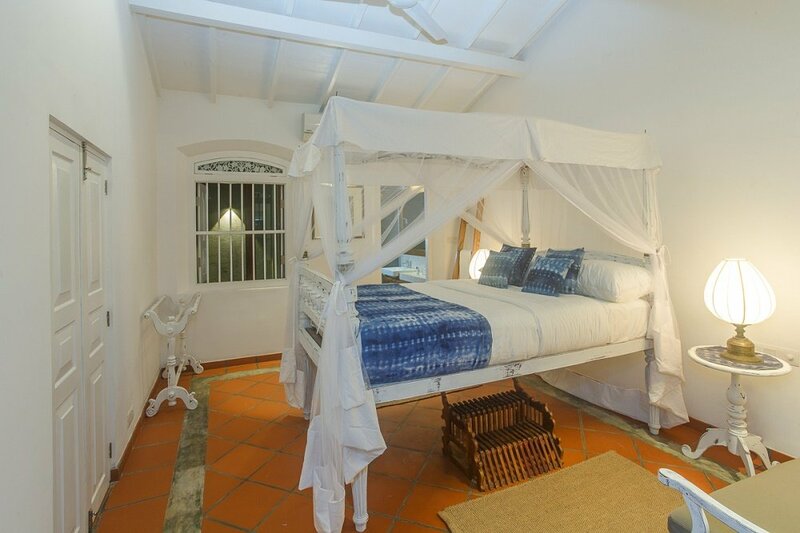 Sleeps: 10 adults. 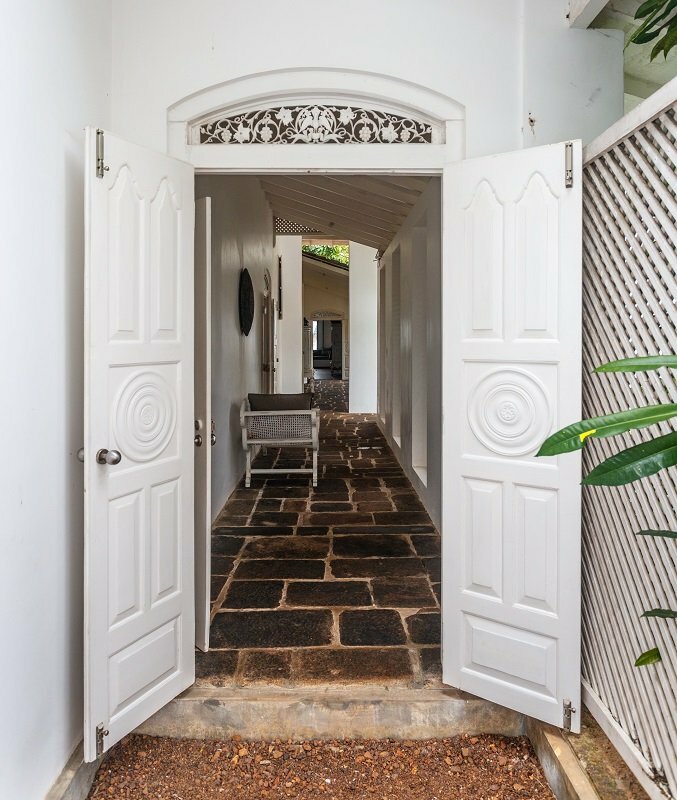 Please enquire for real time availability. 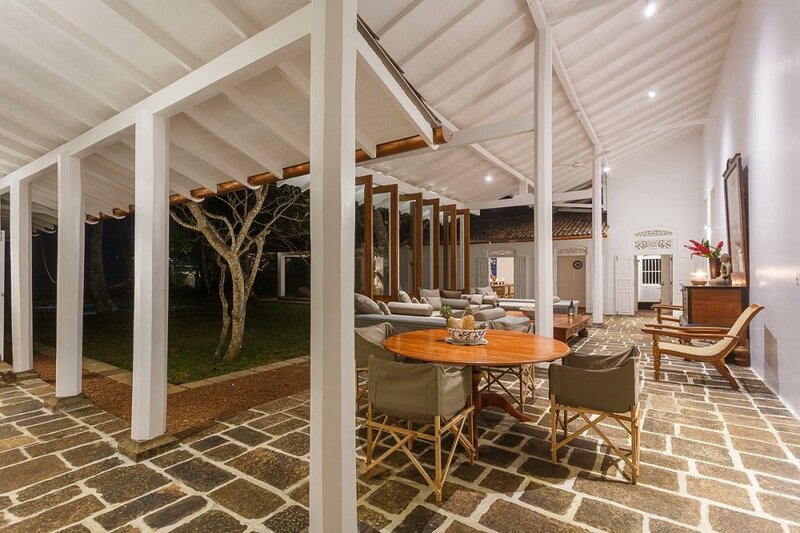 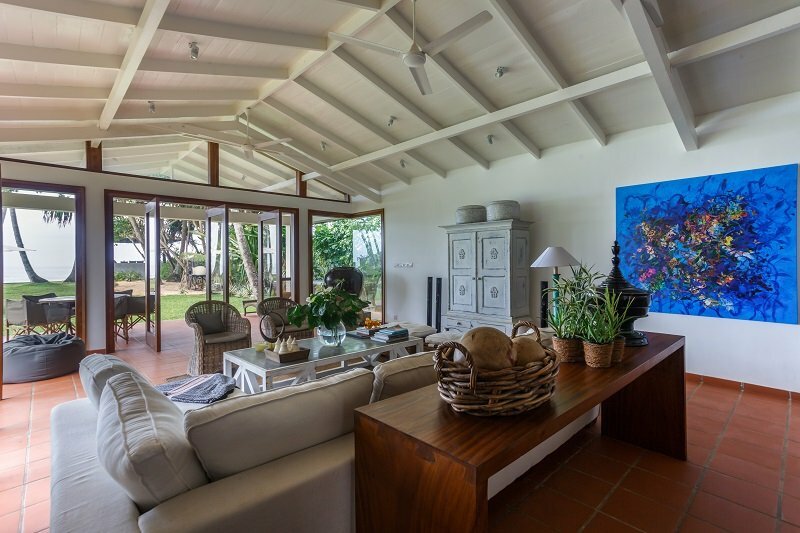 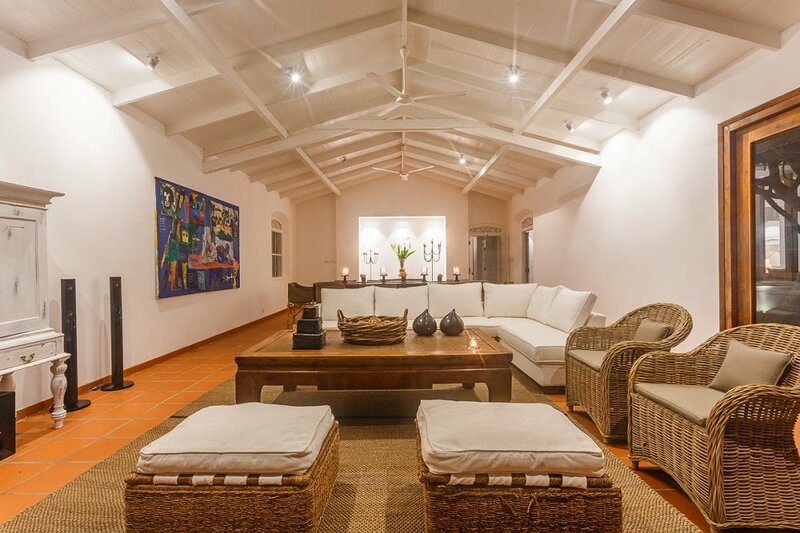 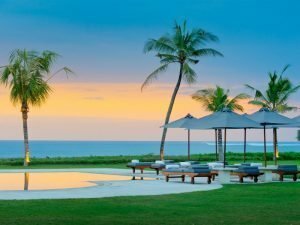 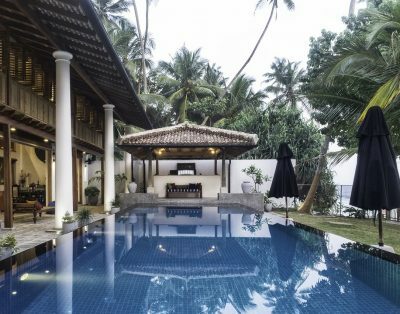 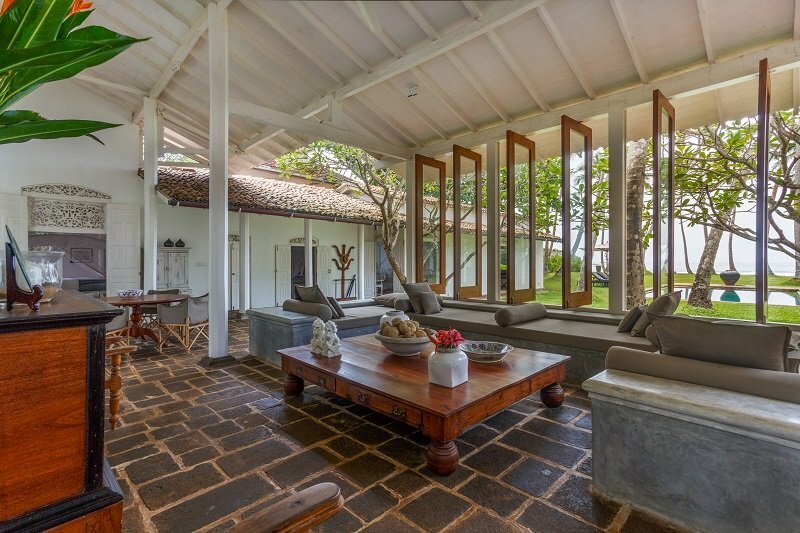 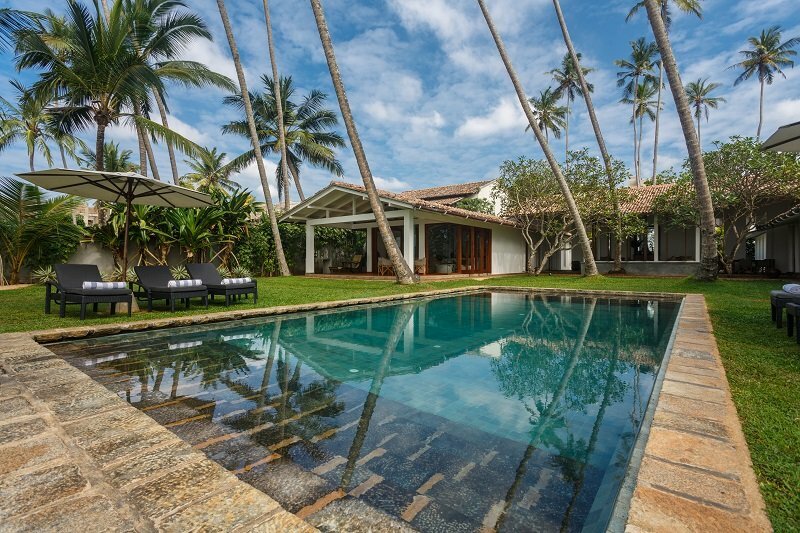 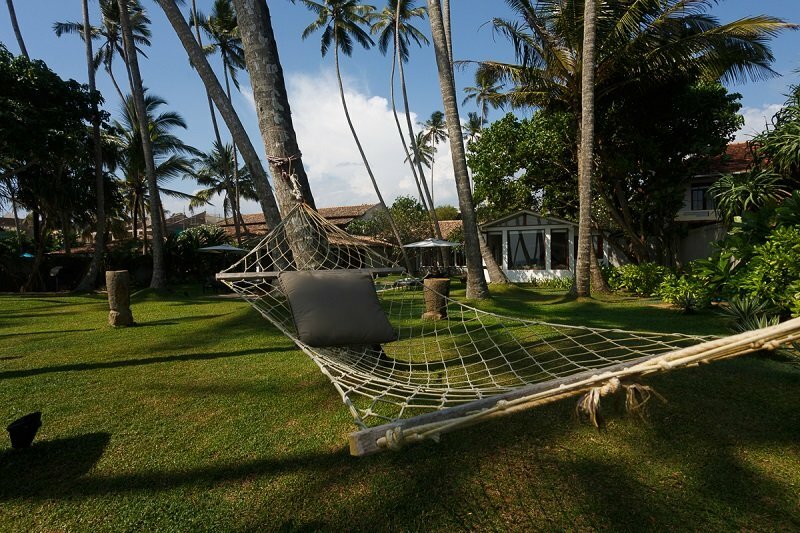 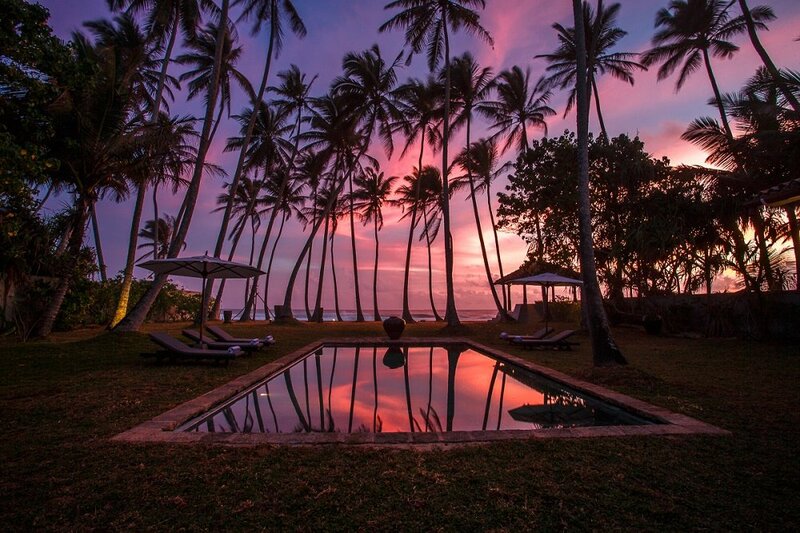 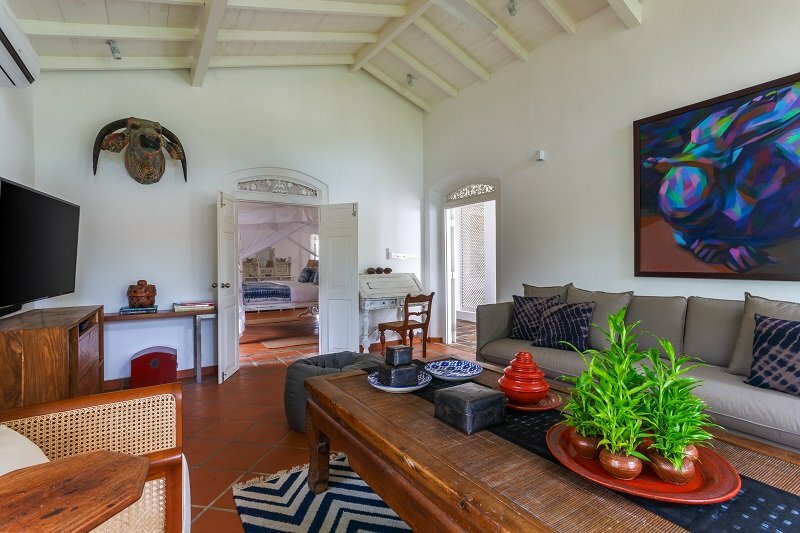 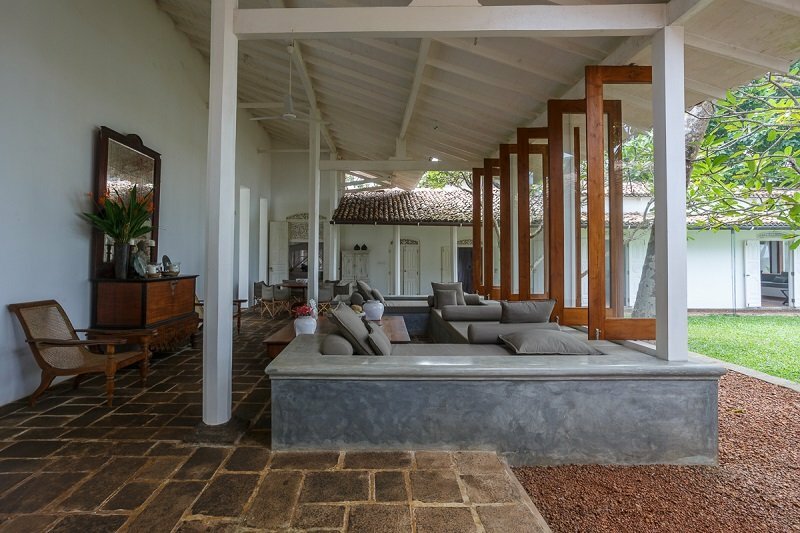 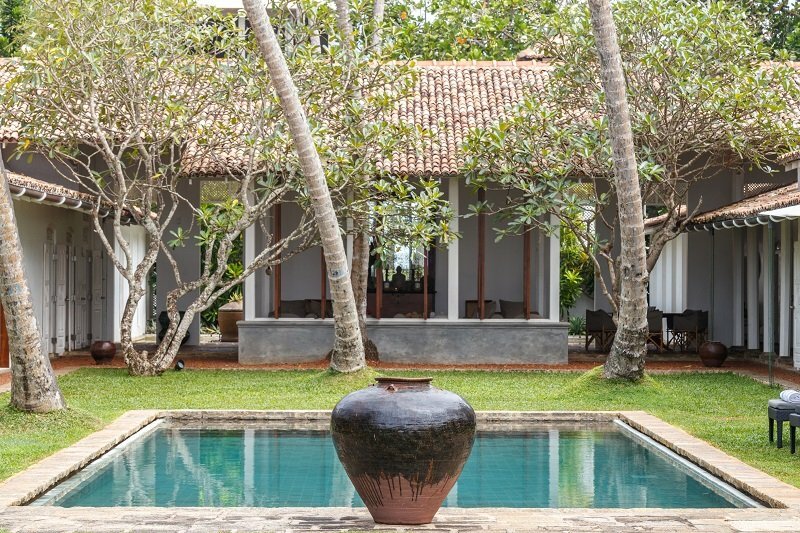 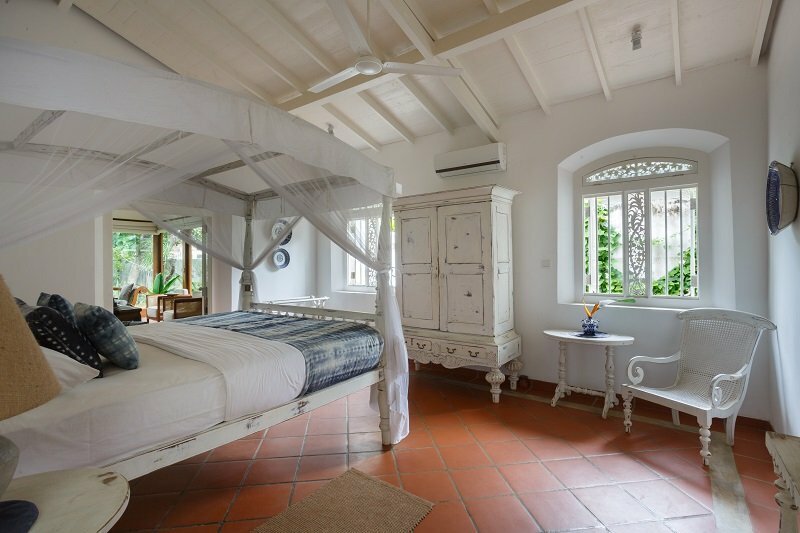 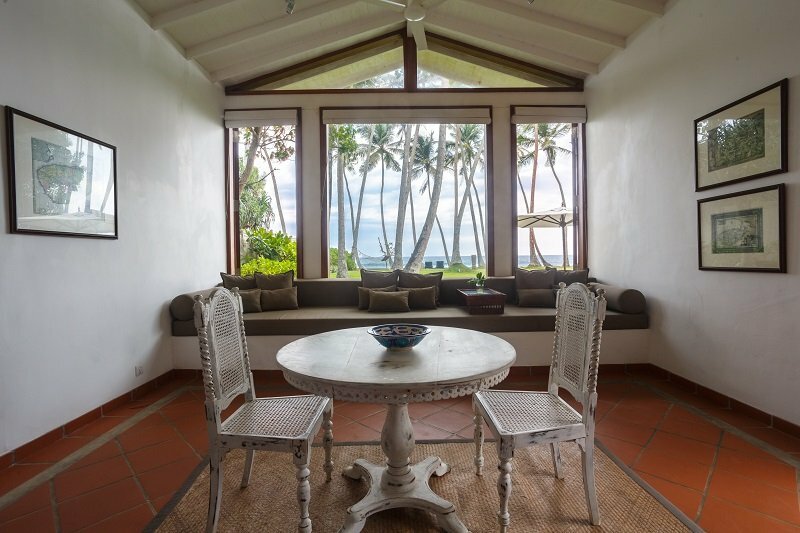 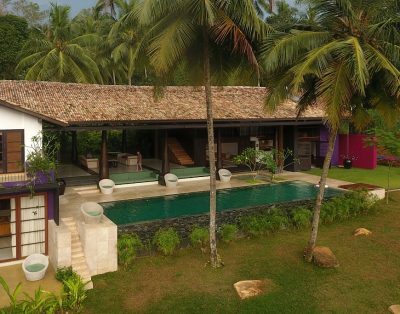 This beautiful villa is located on the sun-kissed sands of Talpe, a 20-minute drive from the heritage city of Galle, neighboured by private villas and boutique hotels, and close to Dalawella’s lagoon-like swimming beach. 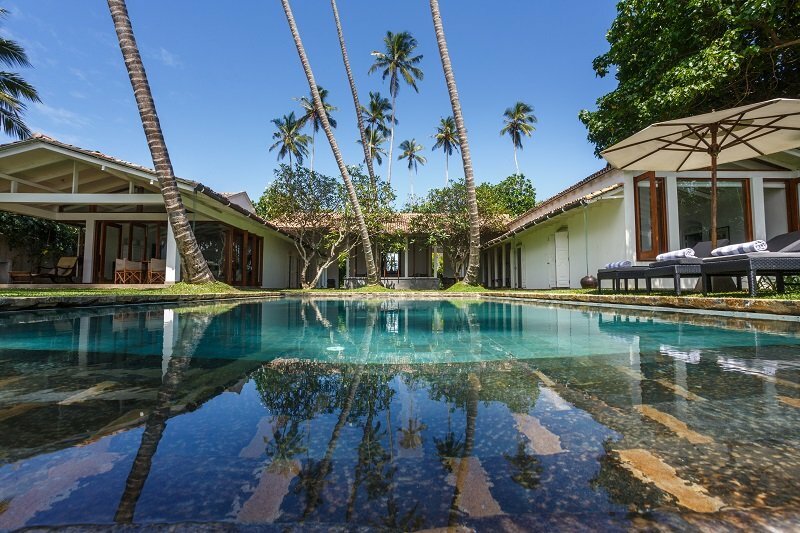 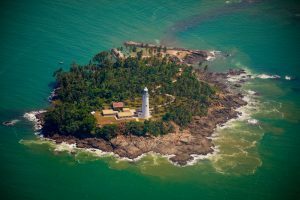 Inland, the scene turns from blue to green as oceans of paddy fields fringe a palm-spiked interior where local villages, Buddhist temples, expansive lagoons, tea estates, spice plantations and rainforests home to diverse wildlife lie in wait of discovery. 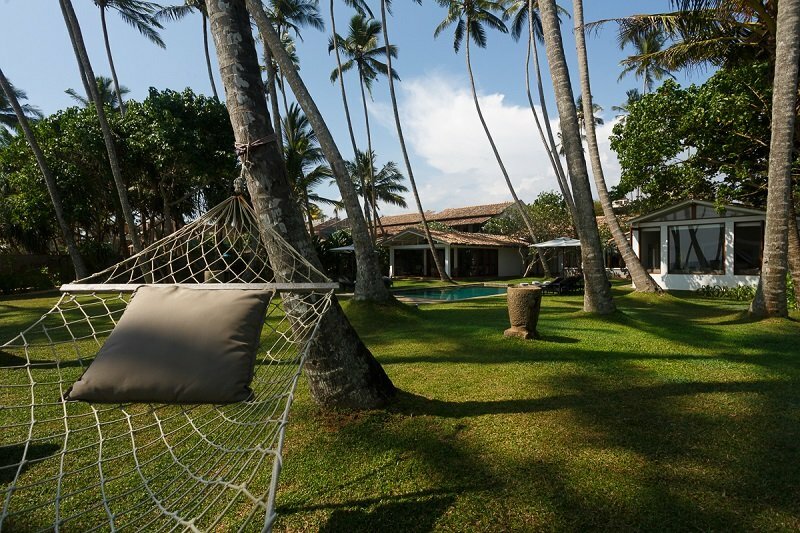 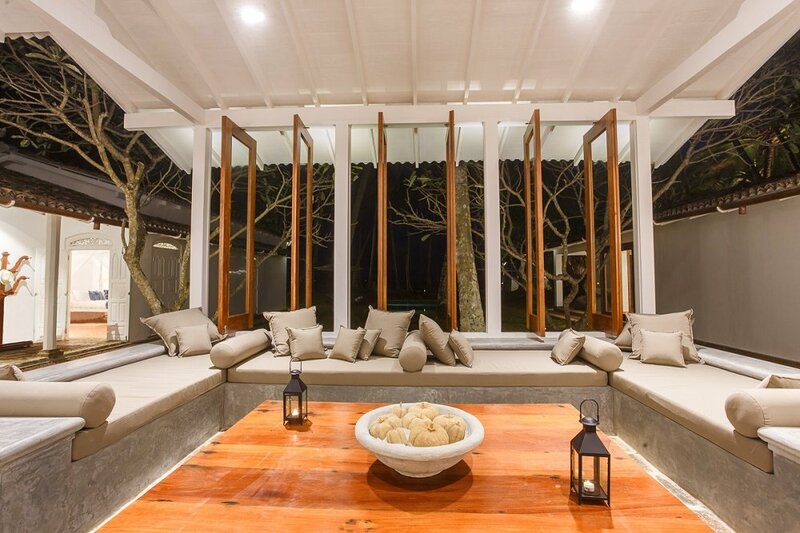 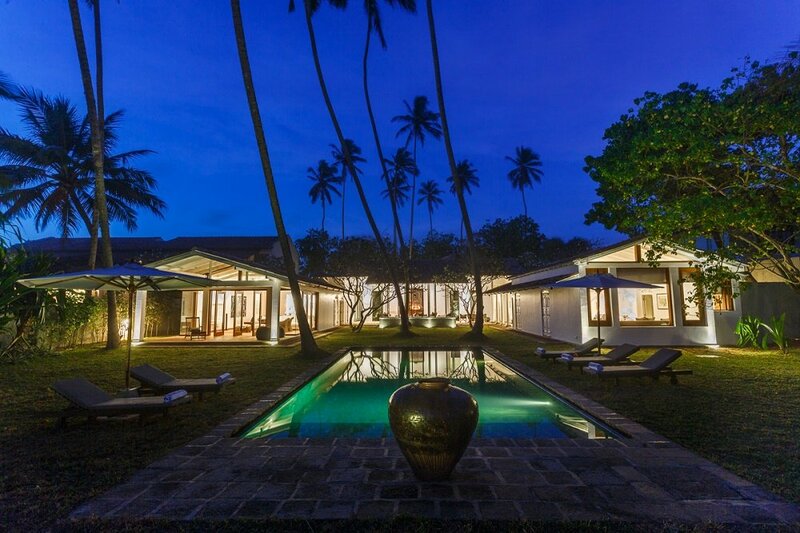 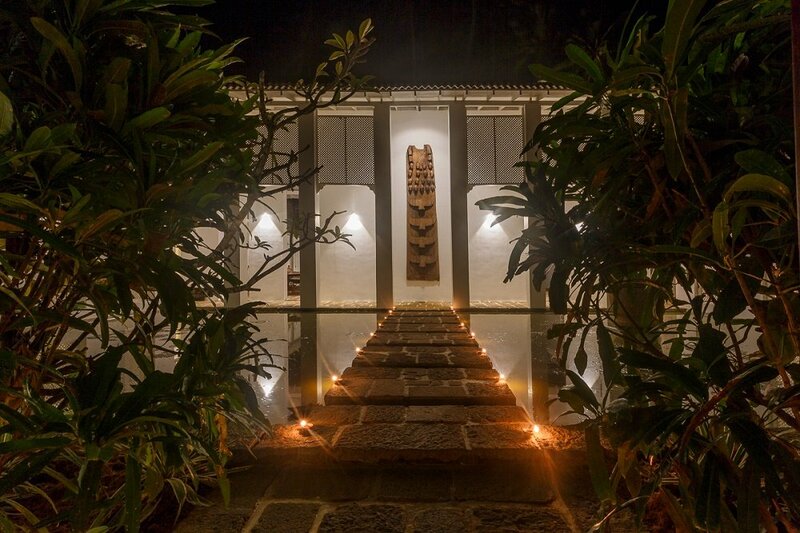 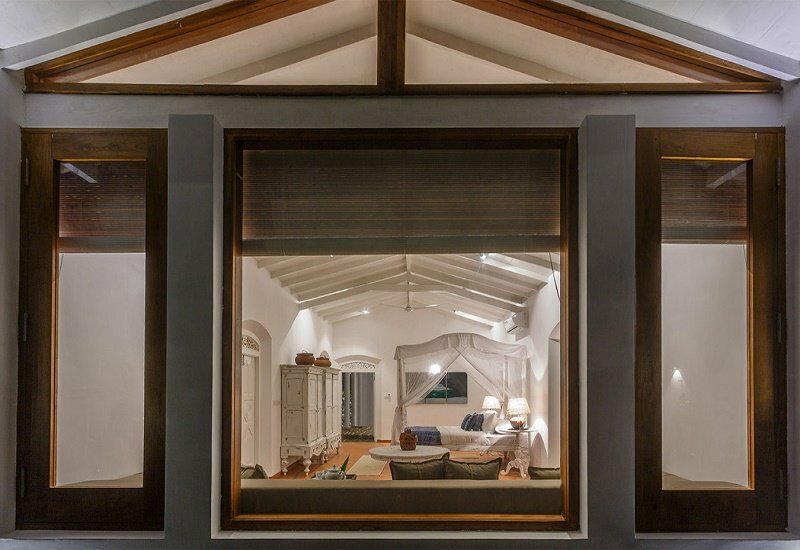 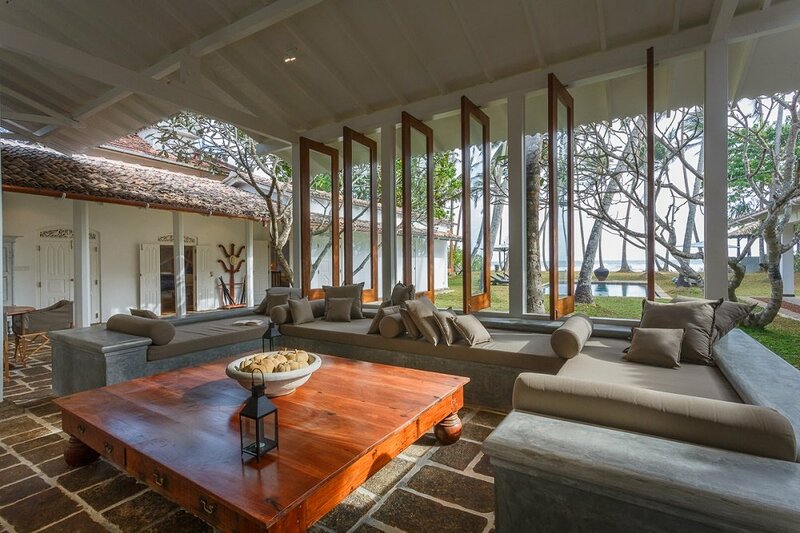 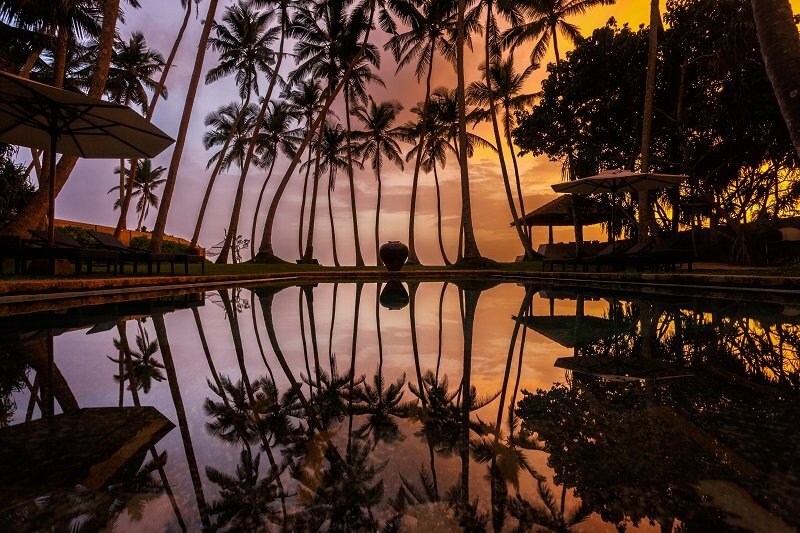 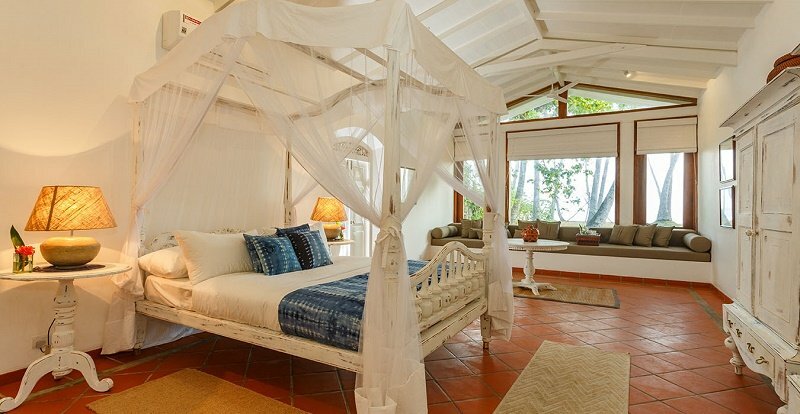 This Villa is an understated five-bedroom villa on Sri Lanka’s southern coast. 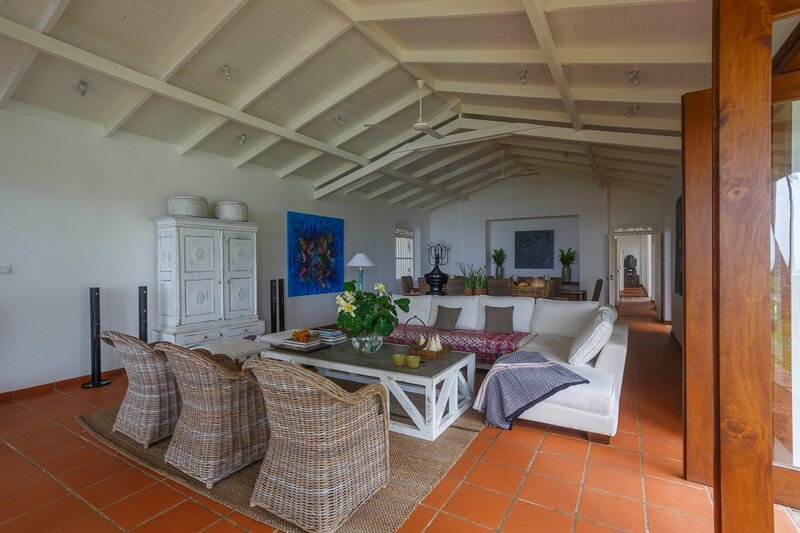 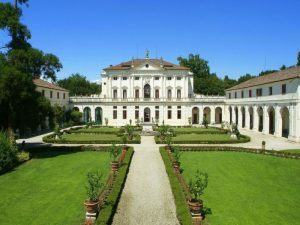 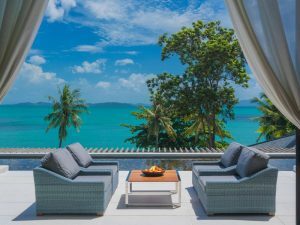 Designed by acclaimed Australian architect Bruce Fell-Smith, its extensive renovation in 2016 has brought the villa firmly into the modern age, whilst sensitively retaining its important sense of history. 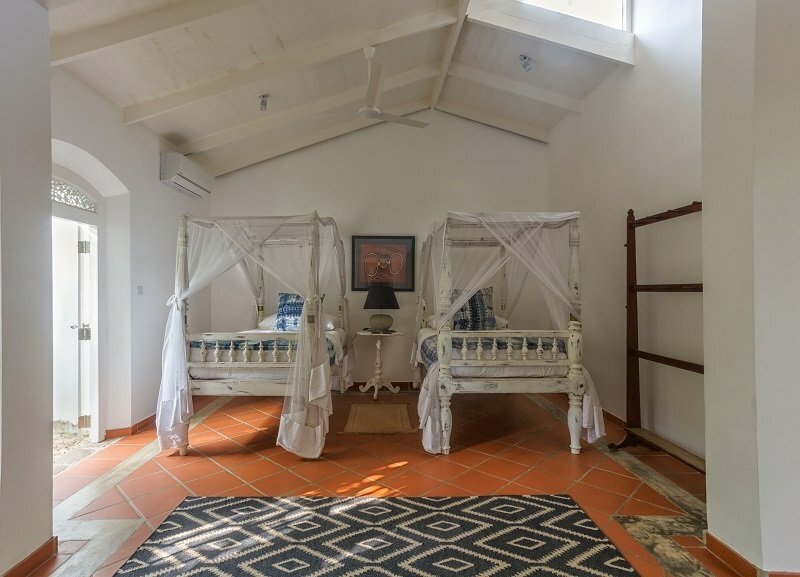 Staffed by a small team including chef, this charming beach villa, a cherished family escape, presents modern artwork, shabby chic antiques and contemporary soft furnishings. 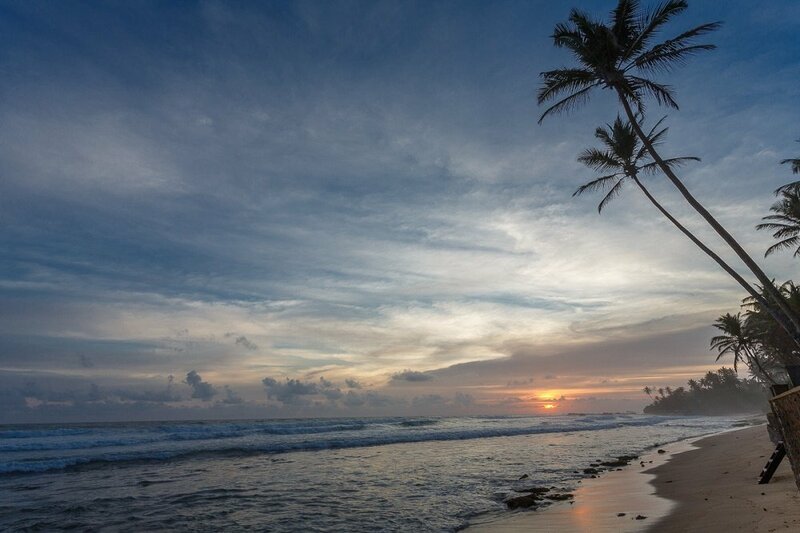 CLOSEST SURFING BEACH: Unawatuna Beach, 5 mins tuk tuk ride or Wijaya/Dalawella beach, 2 mins tuk tuk ride (all surfers). 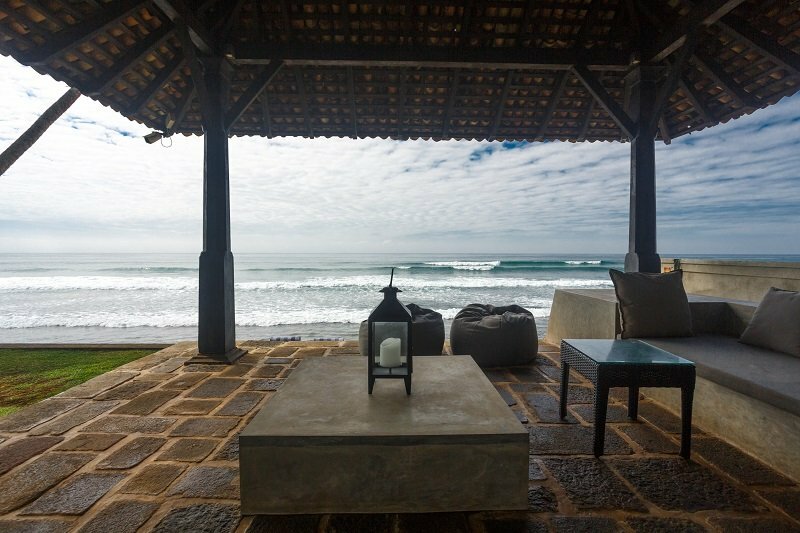 CLOSEST SEASONALLY SAFE SWIMMABLE BEACH: A 15 minute-walk (or 2-mins tuk tuk ride) will take you to Wijaya/Dalawella beach with great swimming and surfing. 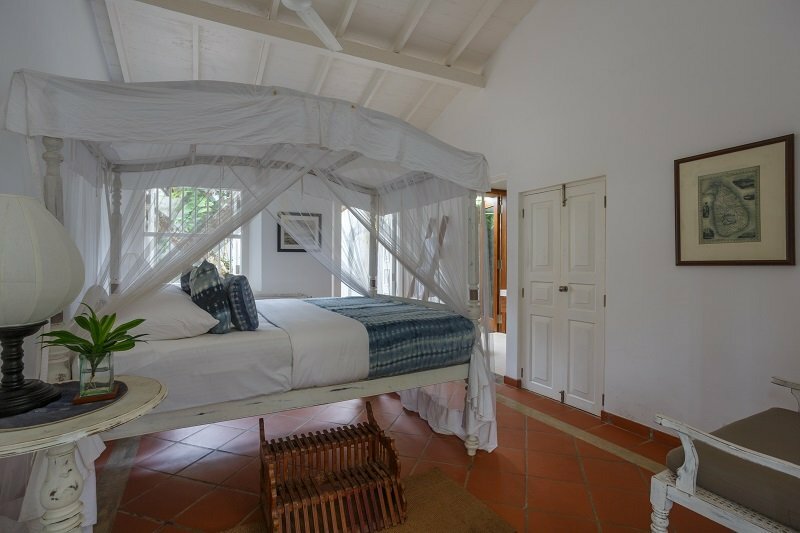 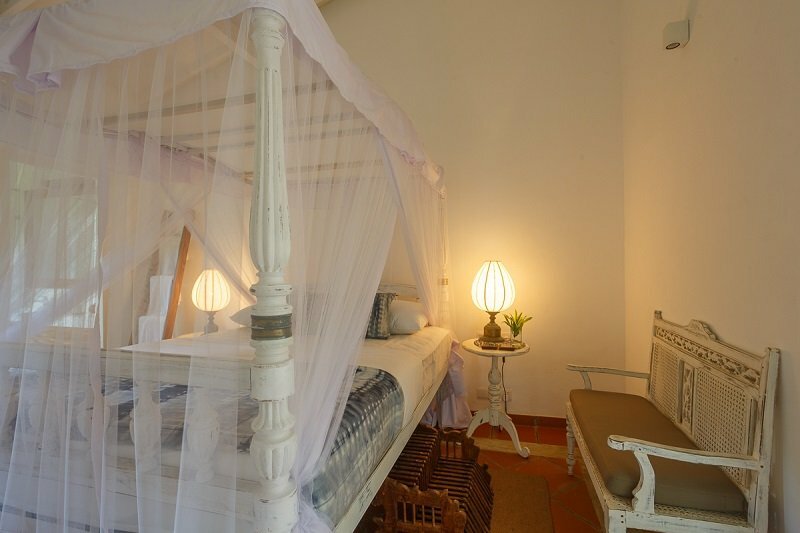 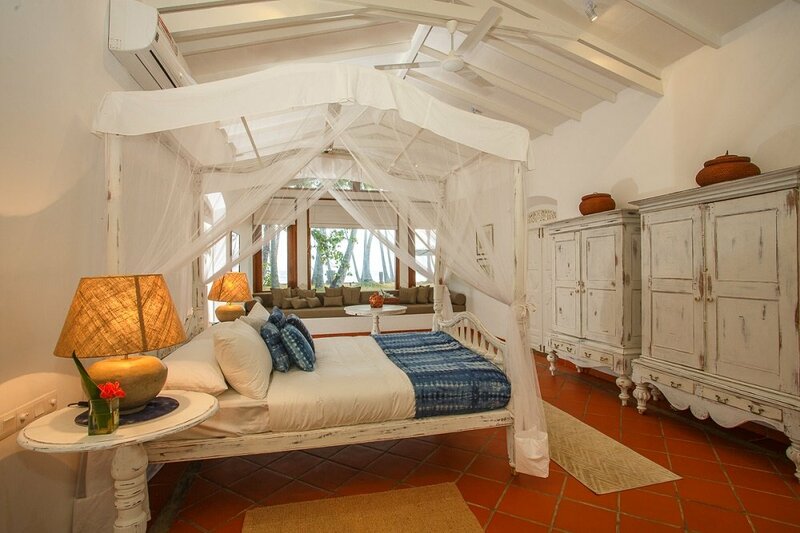 The villa has five comfortable air conditioned bedrooms: four doubles and one twin. 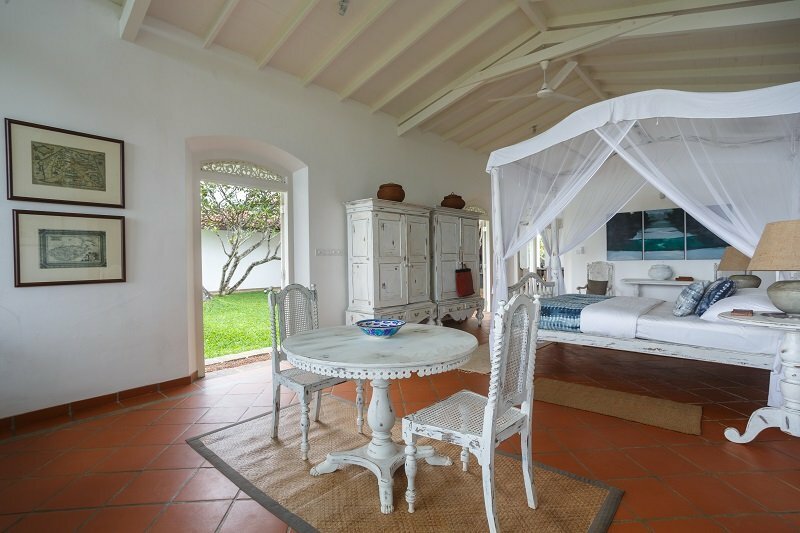 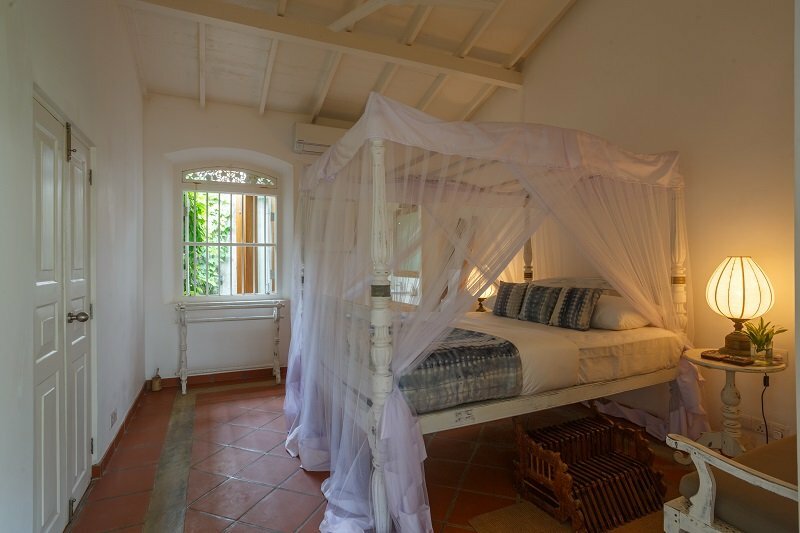 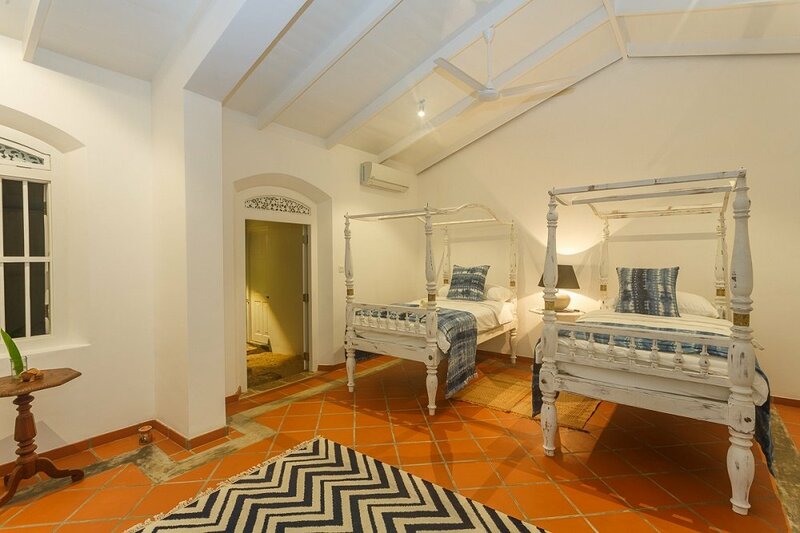 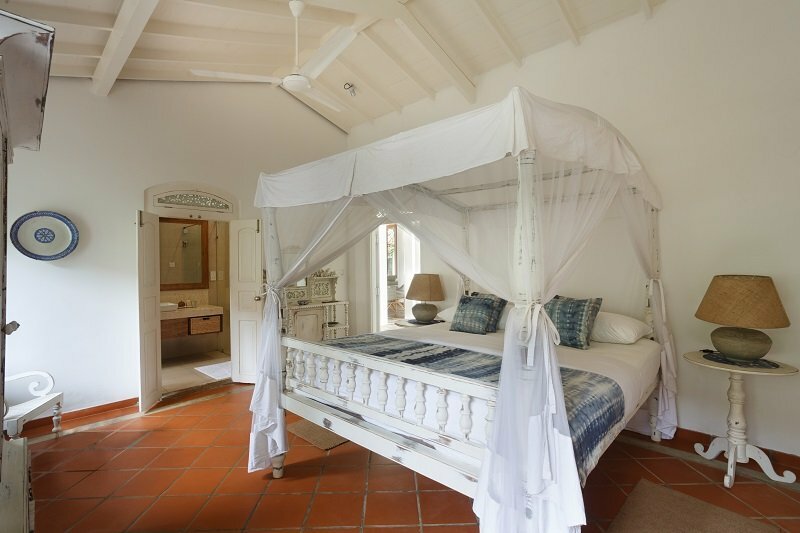 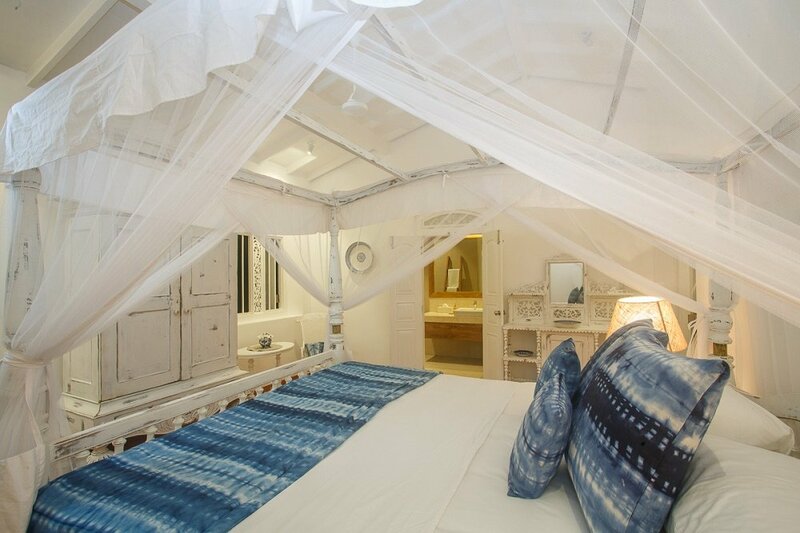 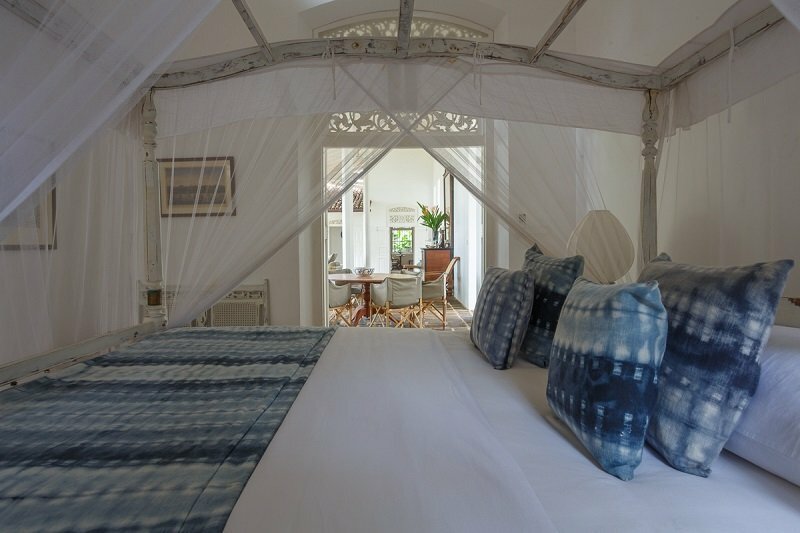 Bedrooms are furnished with whitewashed antique four-poster beds dressed in high thread count linen, and have private bathrooms finished in taupe marble with monsoon showers. 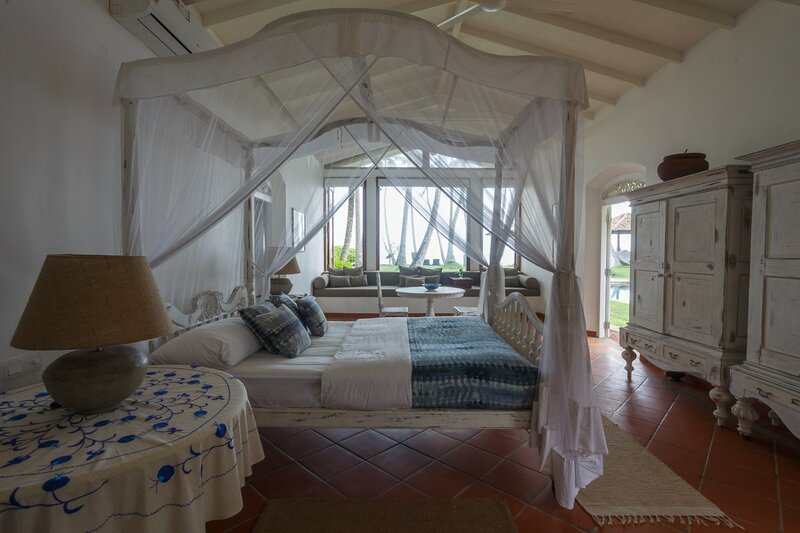 The master bedroom is an exceptionally spacious suite with a deeply cushioned built-in window seat that offers beguiling views of the sea. 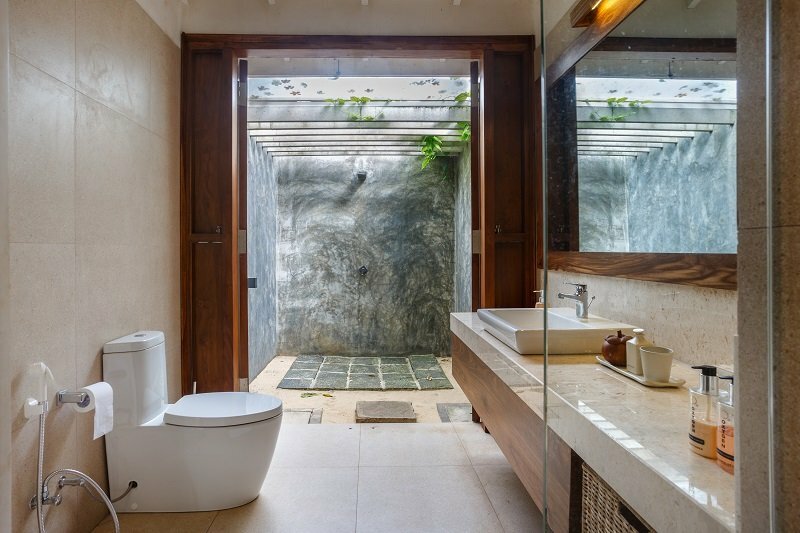 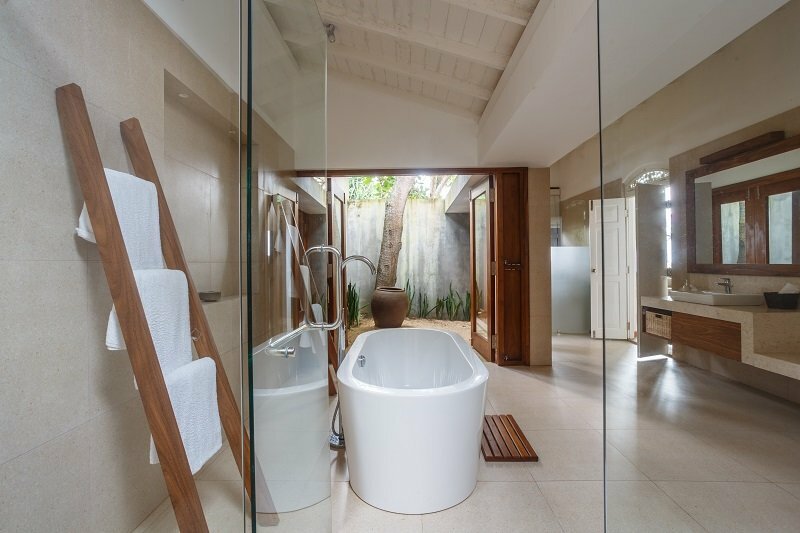 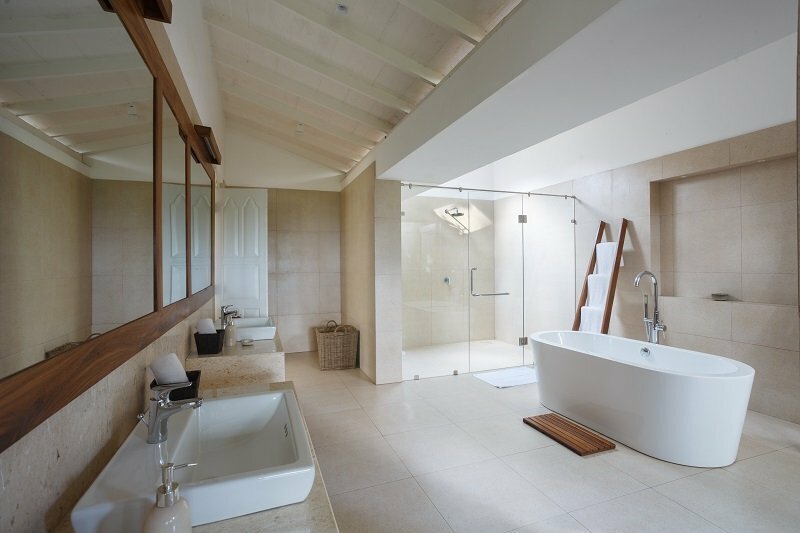 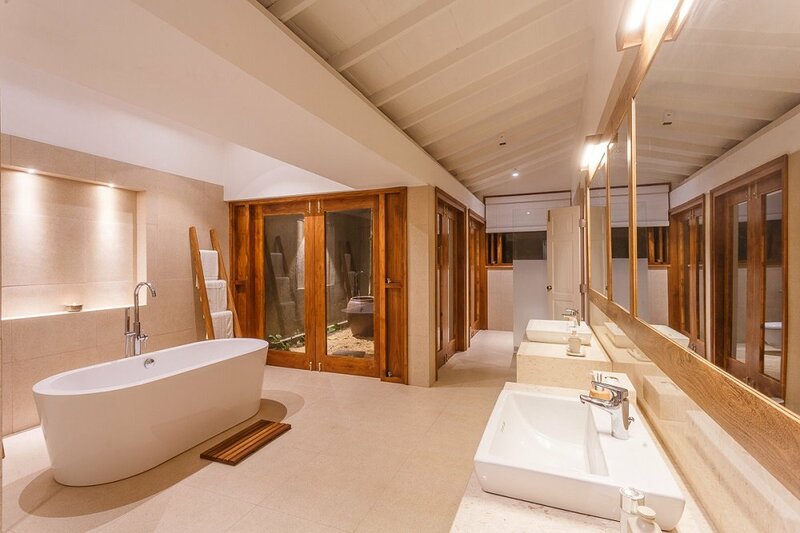 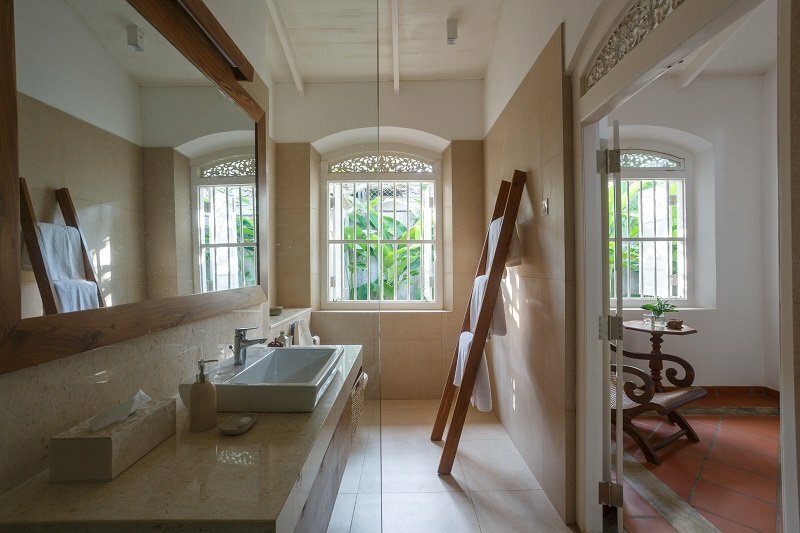 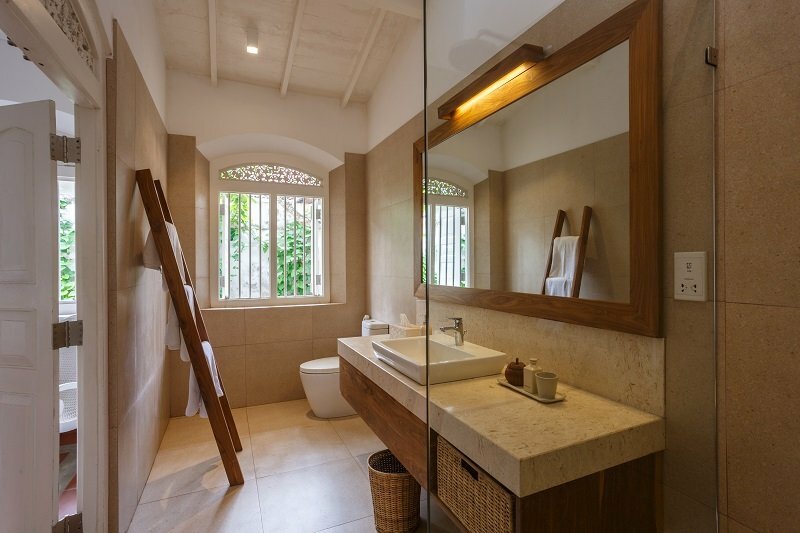 Its sandstone and marble bathroom is particularly special, and features a freestanding tub, twin washbasins and a monsoon shower. 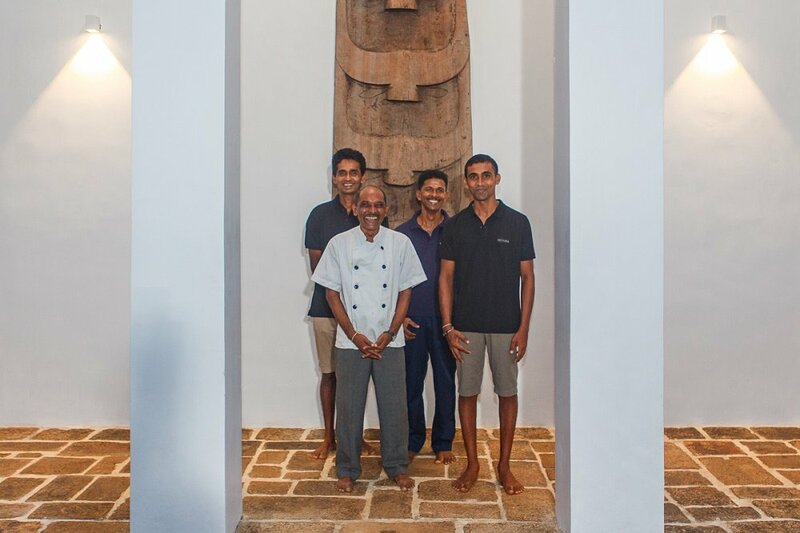 The staff team has a long history with the villa, and are dedicated to ensuring their guests feel comfortable, secure and at home. 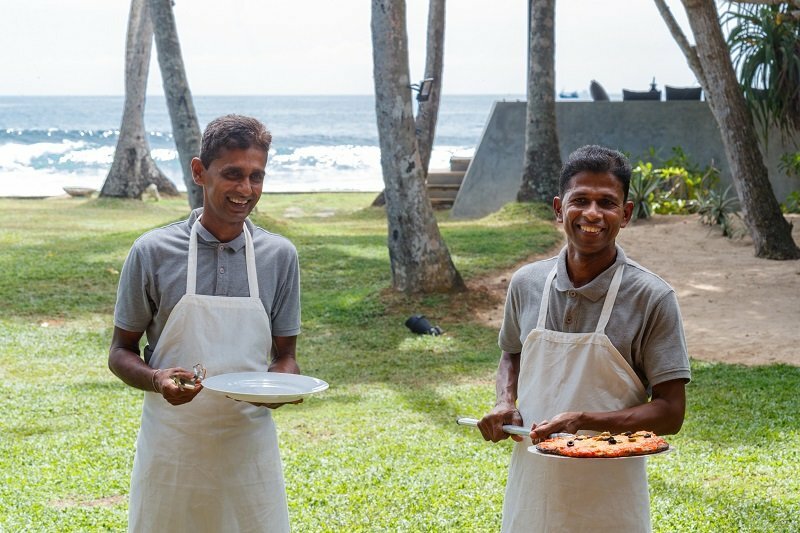 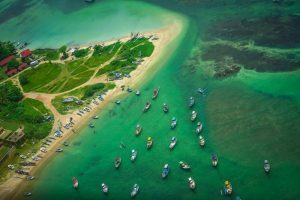 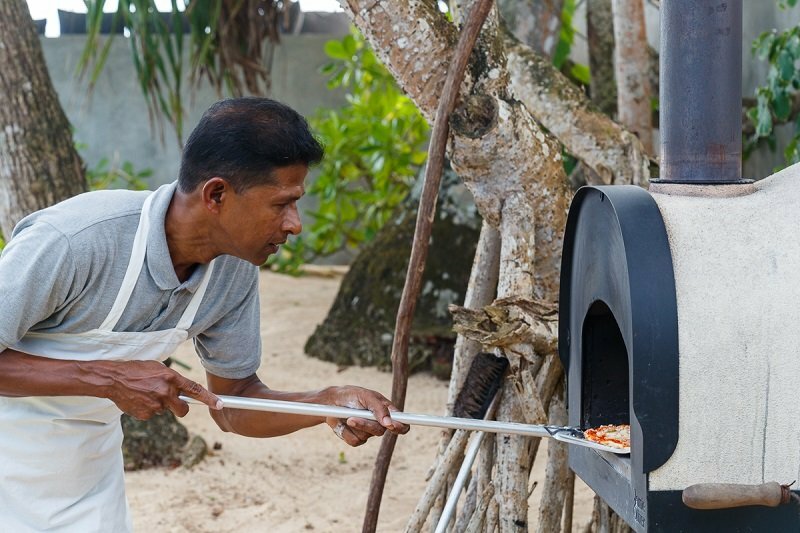 The experienced cook has a flair for international cuisine, and can prepare delicious Sri Lankan curries, nutritious salads, warming soups, ocean-fresh fish and seafood dishes with ease. 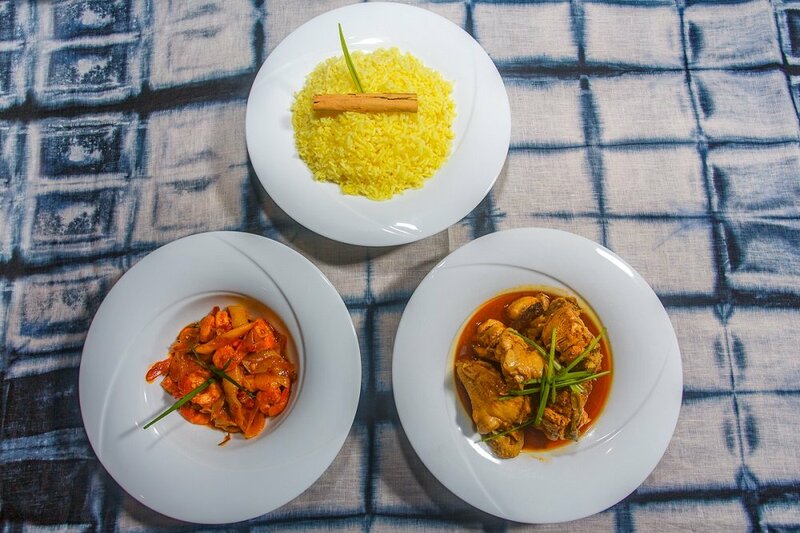 Meals are shopped for and cooked at cost price after discussing menus with the chef. 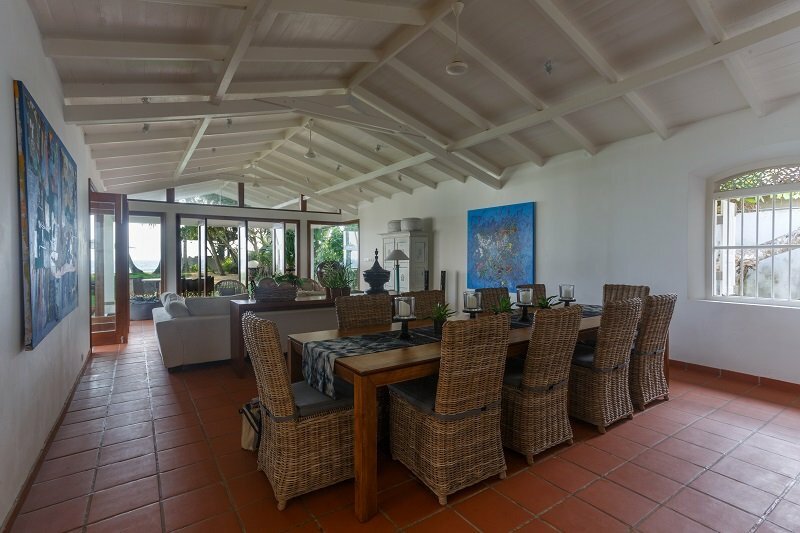 Dine in the open plan living room, lunch on the veranda or pair breakfast with spectacular sea views from the elevated garden pavilion. 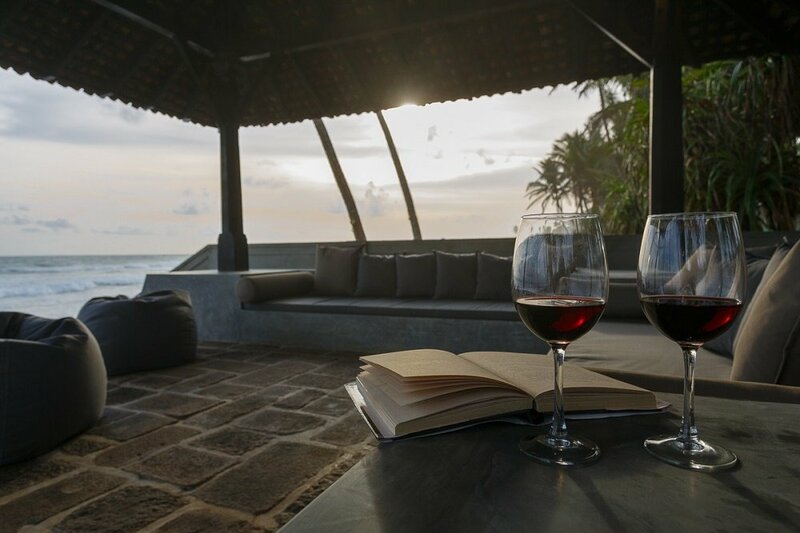 No alcohol is served at the villa, but you are welcome to bring your own or purchase from local liquor shops. 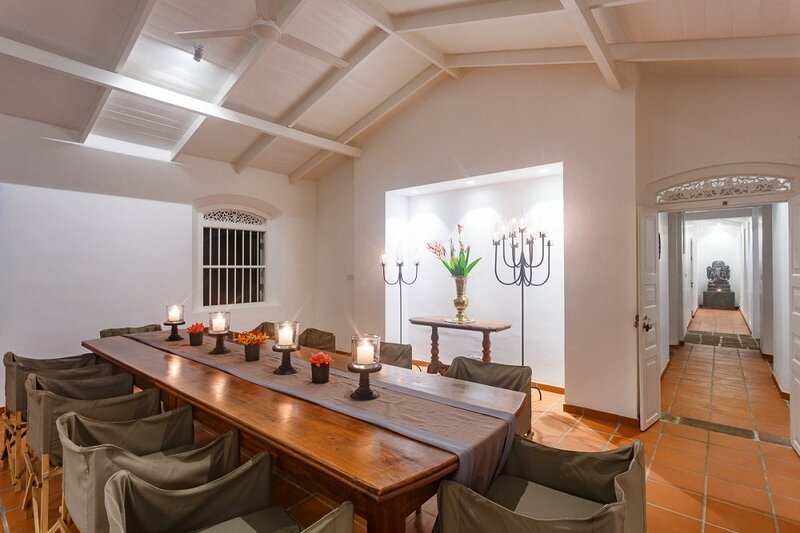 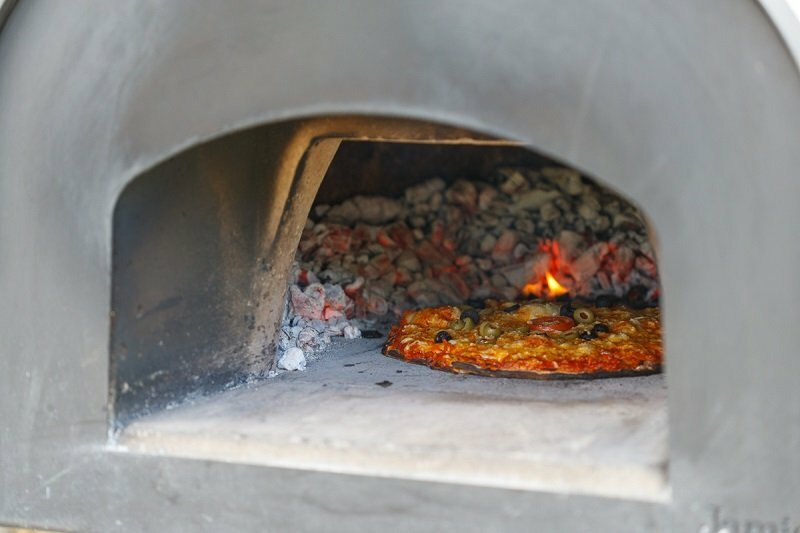 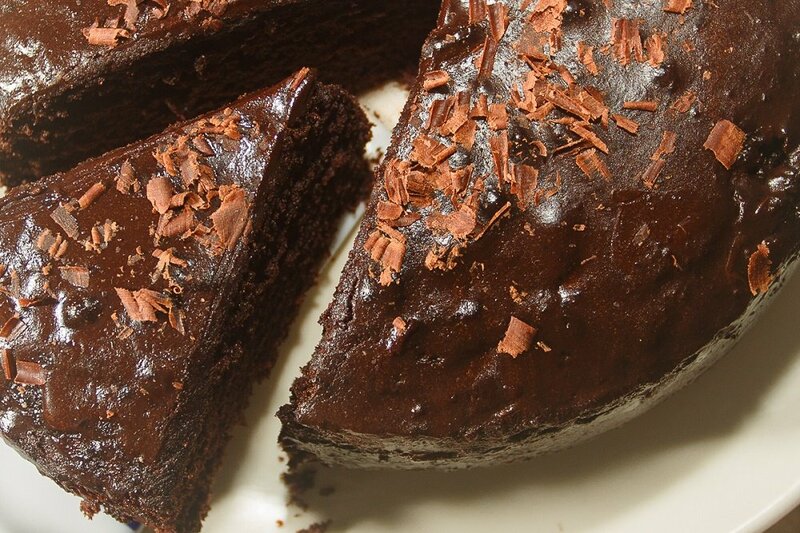 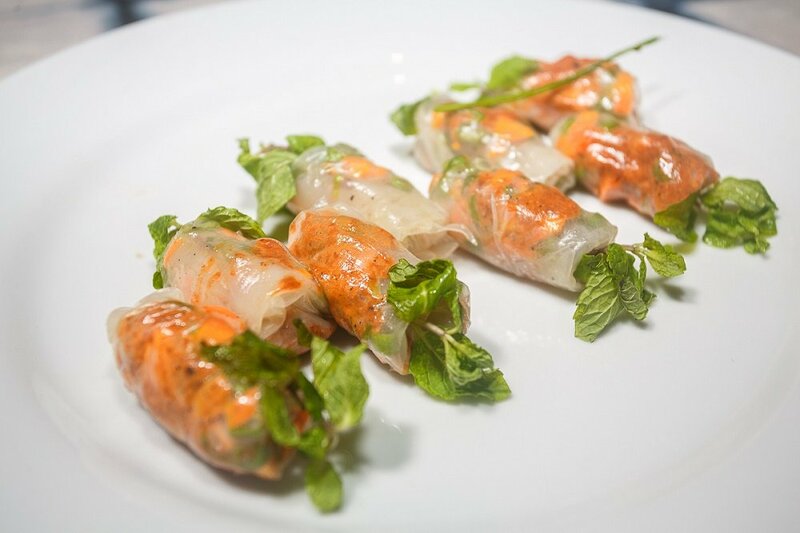 Galle is increasingly cosmopolitan and offers a growing range of restaurants, cafes and bars. 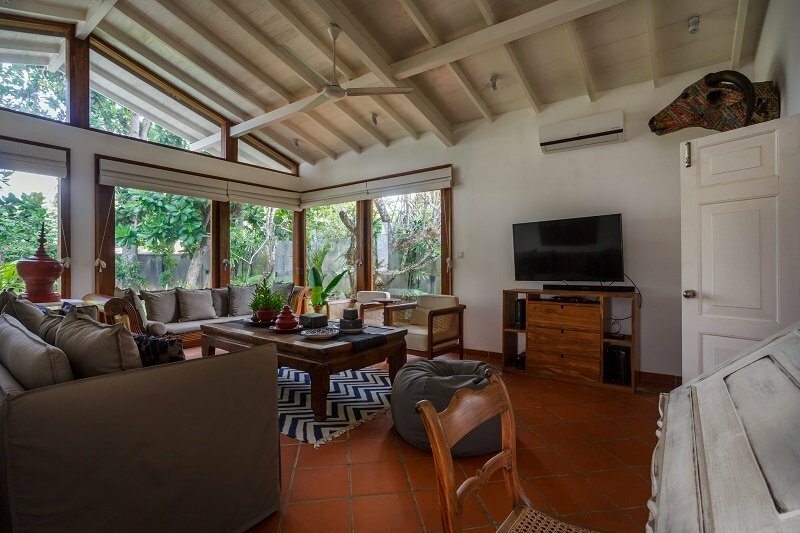 Garden offering ample space for a casual family game of cricket, volleyball or football. 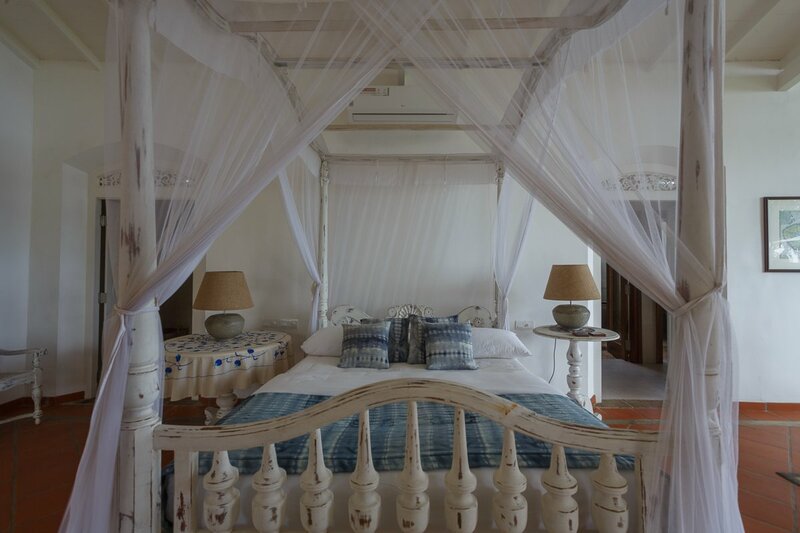 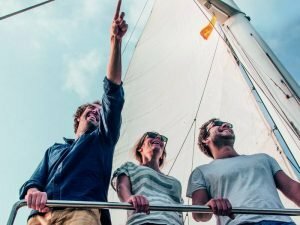 RATES ARE INCLUSIVE OF 10% SERVICE CHARGE AND ALL TAXES.